The photograph is simple and sweet, and just beautiful. Helene, I just can't get enough of your food photos. I love your composition and creative use of props that just embrace the subject and create an amazing impact. Love the pot/cup that is subtle and doesn't obstruct the main subject. Also love the two other pots in background. haha! I love that you have a french word that you teach to people. I studied french for 4 years and I am also half algerian so I grew up speaking it (badly) but I do believe it is the most beautiful language in the world. Every phrase sounds like a line of a poem. And a simple word like :strawberry: transforms into something silky and lovely to say! That is such a lovely shot! Love the photo and the cute little cup! Absolutely adorable. Thank you for the beautiful photo. As always, you take gorgeous pictures. Now I need to get me some "fraises"! ah bah oui les fraises ! what a gorgeous photo above. no way i could be patient and wait for local swiss strawberries to start showing up at the markets here in zürich this summer. i gave in and bought a kilo crate of the brightest red strawberries from spain just this morning. so good ! and guess what i made with them - a rhubarb berry crumble, inspired by *your* recipe ! :) merci !! you take amazing pictures dear! There's fraises madness going all around!! I am assuming that is you pronouncing this one today. I wanted to learn French so bad in high school. My mother convinced me to learn Italian or Spanish. But I just wasnt wowed by them so I did not have the passion. In NY where I live French is not too common. I regret not moving forward with French. So I love your idea here. Such a beautiful picture of strawberries! I looove them. What a gorgeous photo! There is nothing like a basketful of sweet, juicy strawberries, still warm from the sun. Hum! La meilleure des fraises: la gariguette :) Vivement que l'été arrive! Gorgeous. I can't wait until our strawberry season arrives. So sweet and beautiful! 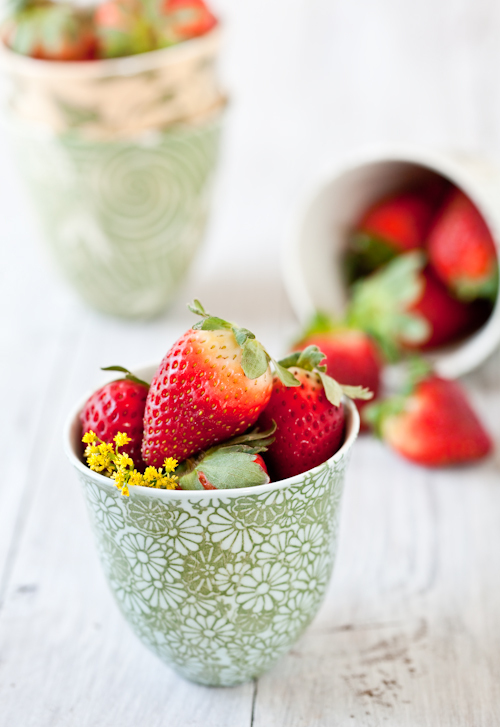 I love your patterned cups...really makes the strawberries even more mouth-watering! As always, great photos! Wow. By just looking at the strawberries, it makes me feel that summer is really here! Thanks for sharing! yummy. I am growing strawberries right now in my garden, but the first one that was ripe for the picking was stolen by an animal in the night! Or my husband this morning. Your photography is brilliant! So soothing and calming. I must have not popped in for a while because I have missed a few. The choc cake looks wonderful! I love your photos...except that they make me SOOO hungry! Reading your column makes me feel much better about my daughter switching from Spanish to French this year. I think Spanish is much more practical, but your blog helped remind me how lovely the French language is...Thanks!